Yerettê – Home of the Hummingbird – is one of the leading visitor attractions in the twin island Republic of Trinidad and Tobago. It is in the lush Maracas Valley, which is nestled in the Northern Range of the island of Trinidad. Yerettê is a hummingbird attraction and provides an opportunity for visitors to get an in-depth experience of the magic of the smallest of birds up close and personal. Visitors experience hummingbirds in their hundreds, and often in their thousands, throughout the year. 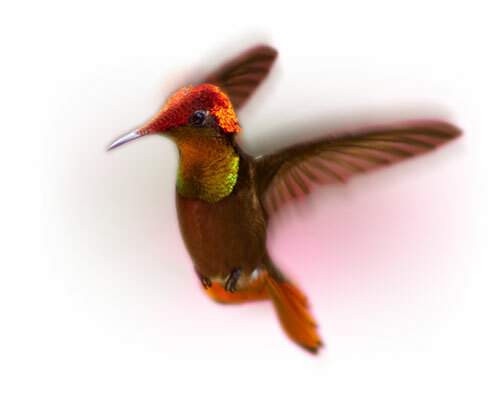 Up to fourteen of the eighteen species of hummingbirds found in Trinidad and Tobago visit Yerettê, most of which can be seen during a typical visit. Visits to Yerettê are organized on an appointment basis only and at fixed tour times. We are open on most days but not every day. Each tour is limited to a maximum of twenty-five persons and is organized as an in-depth educational experience. During the tour, visitors are first exposed to a general introductory talk on hummingbirds. The viewing of live hummingbirds (garden walk) which are usually present in the hundreds, follows this talk. Following the live show visitors are invited to view the Yerettê photo-gallery, in which Theo's photography is displayed. Photographs may be purchased from the wide range on display. Refreshments are served with each tour. Fresh homemade exotic fruit juices are always served. To crown it off, we do a highly educational photo-show with live commentary towards the end of every tour. Payment is accepted as cash or check only. On making your booking with Yerettê please let us know if you have any dietary restrictions or needs and we will do our best to accommodate.